The English bulldog is a stocky, hefty medium-sized dog with the cutest underbite you’ll ever see. We’ve researched and reviewed a ton of options on the market to help dog owners find the ideal option for their bulldog. Before jumping into our reviews of the best food for bulldogs, check out these specs to consider when choosing a new kibble! Food Type - Dry, wet, and raw foods are the main options on the market, each with different advantages and issues. Dog Age - Your dog’s nutritional needs change from puppyhood to adulthood to old age, and a dog food should address that! Package Size - The package size is a great way to compare value across different dog food types and brands. Dehydrated - Dehydrated dog food is a convenient way that people provide raw food for their dogs with a better shelf life. Main Protein - Although chicken and beef are the most common, there are a lot of other cool protein sources out there! Made In - We focused on dog foods made in the USA as a source of consistent quality and well-regulated dog food. Now that you know what to look for, let’s get into the reviews! Our top pick and budget pick are our favorites for the best bulldog food, but there are tons of amazing options out there, so keep reading! Your bulldog’s chow time is about to get even better! Our pick for the best dog food for English bulldogs is this breed-specific option from Royal Canin. Made just for the needs of the adult bulldog, this dry dog food is a sure winner with your canine companion. The kibble size and shape is designed specifically for the bulldog’s short, upturned muzzle, so it’s easy for them to grasp and chew. The ingredients are designed to reduce stool odor while supporting digestive health with a balance of fiber and prebiotic FOS that can also help improve issues with gassyness. Supplements for bone and joint health include calcium, vitamin D3, chondroitin, and glucosamine. EPA, DHA, and omega fatty acids encourage hydrated, healthy skin and a soft coat. 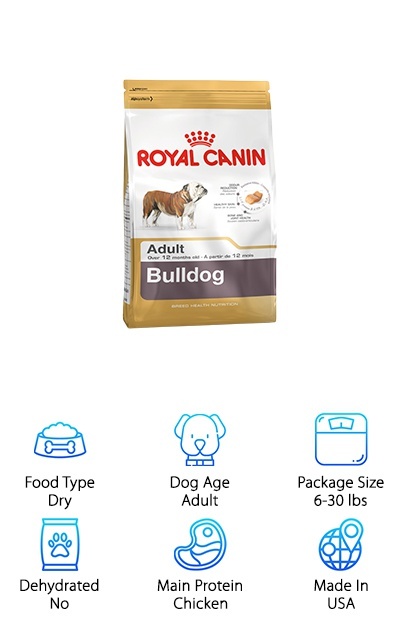 If you want a dog food tailored to the needs of your bulldog, Royal Canin has you covered! 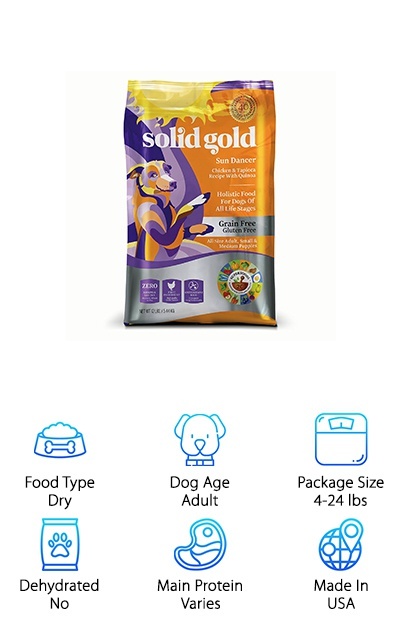 Our favorite option for the best dog food for English bulldog breeds with a low price and amazing ingredients is… Solid Gold! This holistic, grain-free, and gluten-free dog food offers unique protein sources and no meat by-product meals. Recipes include Salmon, Chicken, High Protein Beef (good for active dogs), Lamb, Quail, and Venison. Along with these high-quality proteins, the kibble is made with superfoods and healthy fat sources to provide nutrients for every aspect of your dog’s health. These superfoods include pumpkin, cranberries, blueberries, broccoli, and kelp, while olive oil, salmon oil, and canola oil provide fatty acids for skin and coat health. Potatoes and legumes provide complex carbohydrates and fiber rather than corn, wheat, or soy products. If your dog has an allergy to chicken or poultry, you can avoid those ingredients with Solid Gold’s many unique recipes. There’s so much to love about this delicious and nutritious natural dog food! AvoDerm is known for incorporating avocados into their dog food recipes as a source of omega fatty acids to support skin and coat health. They also only source ingredients from the USA and Canada, with exceptions for lamb from New Zealand and duck from France. If your English bulldog could stand to lose a little weight, this is some of the best dog food for bulldogs for canines who are less active and looking a little pudgy. You can help your dog lose weight and feel their best without dealing with a ton of extra begging! Chicken meal provides protein, while rice and oatmeal provide carbohydrates for energy without using corn, wheat, or soy. There are no animal by-product meals, either, so you can be sure you’re getting high quality! Antioxidants, vitamins, and minerals support your dog’s immune system, bones, and overall health. 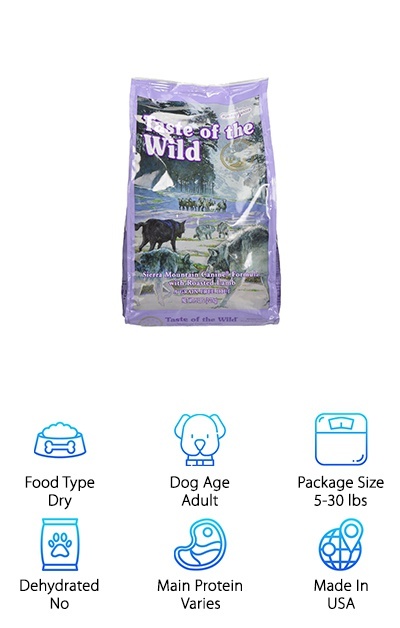 Taste of the Wild is known for providing high-quality natural grain-free dog foods. You can choose from several recipes like Lamb, Bison & Venison, Boar, Salmon, Venison, and Wildfowl. Looking for the best food for an English bulldog that’s allergy-friendly? With Taste of the Wild, you can cut down on your dog’s exposure to poultry, corn, and wheat, which are a few common food allergies in dogs that can be hard to work around with today’s dog food options. Lamb is a particularly good option for sensitive stomachs, since it’s easy for dogs to digest. Other ingredients include whole vegetables like sweet potatoes, potatoes, and peas for complex carbohydrates. Salmon oil is a source of DHA, which is good for coat health. This formula also contains probiotics and fiber to ensure your pup’s digestive system is running smoothly. Taste of the Wild’s grain-free kibble offers unique protein sources your dog will love! 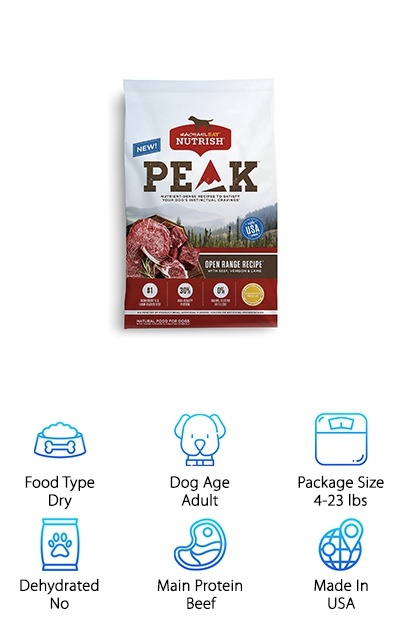 Another amazing option for the best dog food for english bulldogs is Rachael Ray’s Grain-Free Nutrish PEAK dry dog food. First of all, it’s grain-free and gluten-free with no fillers or poultry by-product meal. If your dog has a sensitivity or allergy to grains like corn or wheat, they might like this grain-free kibble! The Beef, Venison, & Lamb recipe features US farm-raised beef as the first ingredient, while the Turkey, Duck, & Quail recipe features US farm-raised turkey as the main protein source. And there’s a ton of protein: a whopping 30% protein content! The average is around 20-25%, so this dog food is a great option for active dogs and the highly muscular body of the bulldog breed. Carbohydrates sourced from peas and potatoes provide complex carbs for energy, while dried beet pulp provides dietary fiber to keep the digestive system happy. Nutrish PEAK is a wonderful choice for your active English bulldog! 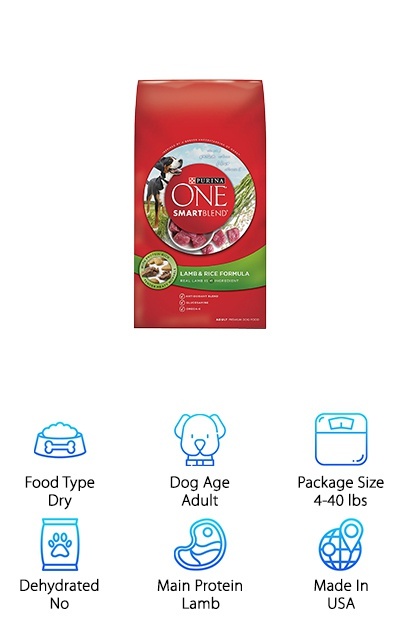 Purina One SmartBlend Lamb & Rice dog food for adult dogs is a tasty and easy-to-digest choice for your English bulldog. The first ingredient and main protein source is lamb, while poultry by-product meal provides a source of glucosamine to support joint health. The kibble features a mix of crunchy pieces and tender pieces for a stimulating meal that will have your dog licking their food dish clean! Vitamin and mineral supplements help to support whole-body health, including vitamins D3, B12, E, and A, plus omega-6 fatty acids for healthy skin and a soft coat. The 26% protein content supports an active lifestyle and helps to maintain your dog’s muscles. And it’s all in one easy-to-digest package! This Purina dog food is a strong choice for best dry dog food for english bulldogs that provides a highly tasty and attractive kibble without cleaning out your wallet. 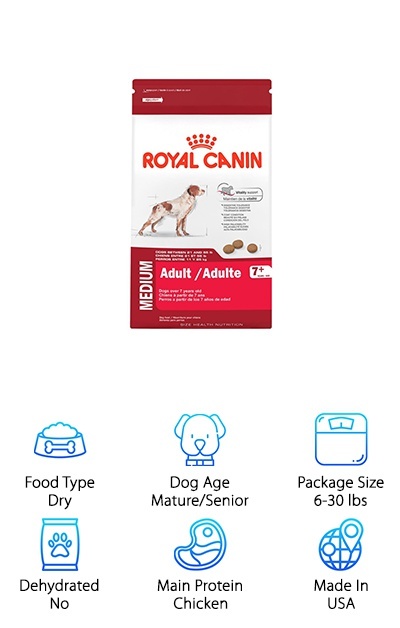 Royal Canin is the preferred choice for many dog owners, and their dog food designed for medium-sized adult dogs is one of the best English bulldog food options around. Available in 6-pound or 30-pound bags, this dry dog food provides a ton of nutrition, plus protein content of 23.3% from chicken. Specifically made with the needs of dogs over seven years old weighing 21-55 pounds, this is a great choice for your mature or senior English bulldog. EPA and DHA support healthy skin and a soft coat, while biotin encourages strong nail growth. Antioxidants and vitamins help to keep their immune system strong, and balanced levels of dietary fiber keeps their digestive system running smoothly. It’s even been designed to have tasty aromas to draw your dog in and get them chowing down with enthusiasm! 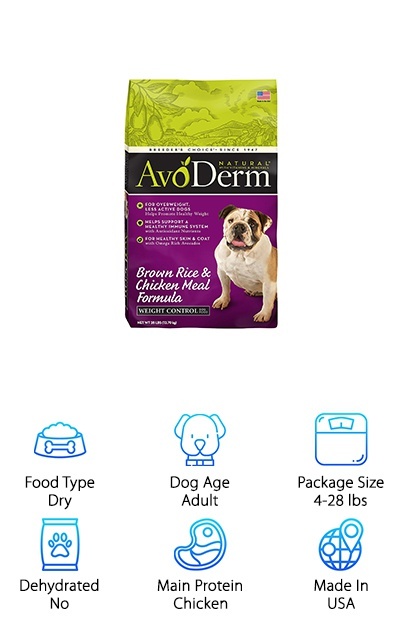 Your mature English bulldog has different nutritional needs than they did when they were a puppy, and it’s nice to have a dog food that addresses that. Need to make your bulldog’s regular meals a little more exciting, or help them to stay hydrated? 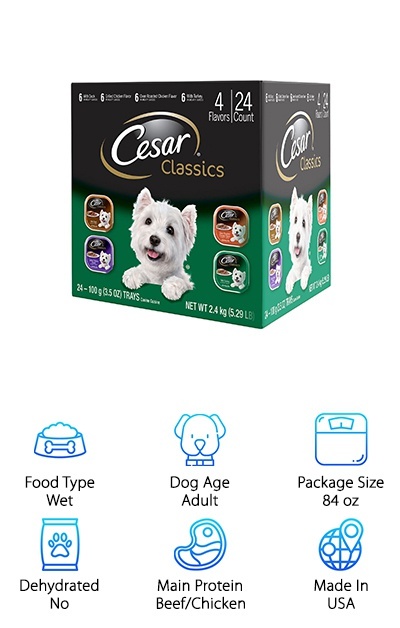 Cesar wet dog food comes in a smooth pate style that mixes easily and is easy for dogs to chew. This variety pack comes with 24 3.5-ounce trays with easy-peel lids, no can openers required. The pack includes flavors like duck, grilled chicken, oven roasted chicken, and turkey. Does your English bulldog sometimes turn down food or seem reluctant to eat? Keeping a fun variety of flavors available to mix in with their kibble is one way to ensure they get the nutrition they need. Each serving is fortified with vitamins and minerals like vitamins E, D3, B1 and A. If you use a once-a-day feeding method, these delicious pates also make for great snacks in the morning, afternoon, or evening to keep your pup energetic and ready for anything! The Blue Homestyle wet food is a great option for natural canned dog food for bulldogs. If your bulldog is allergic or sensitive to common dog food ingredients like chicken, corn, wheat, or soy, Blue Homestyle wet food has some delicious solutions. The Fish & Sweet Potato recipe contains fish meal, whole grains from brown rice and barley, plus whole fruits and vegetables. The Lamb Dinner recipe is another great choice for dogs with sensitive stomachs, since lamb is easy to digest. Other flavors include Beef and Chicken. Wet food can be used to “spice up” regular dry kibble to encourage a healthy appetite, or be substituted in entirely as full meals. Give your English bulldog a delicious treat with Blue Homestyle wet food! Incorporating wet food can also help with doggy weight loss and help your dog stay hydrated. 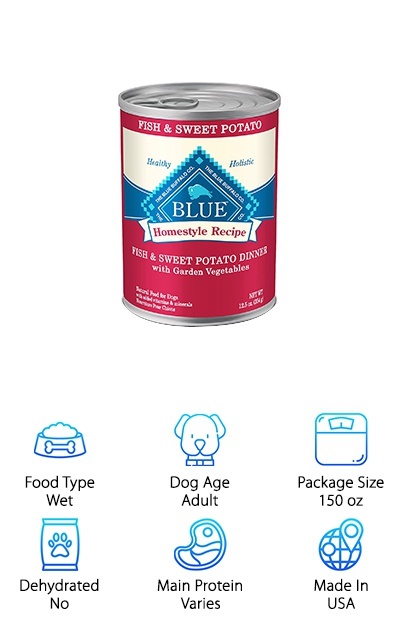 This dog food comes in 12-packs of 12.5-ounce cans for 150 ounces total. 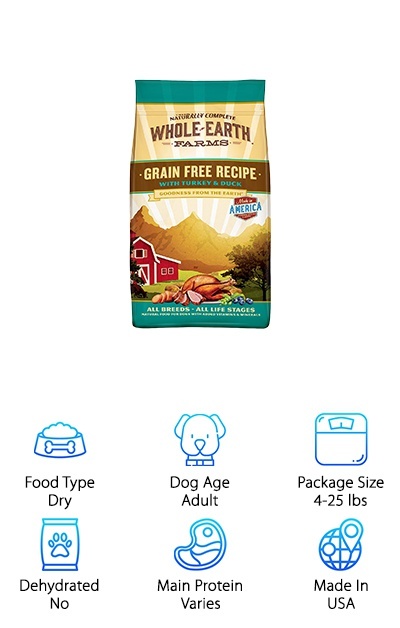 If you’re looking for a natural and grain-free option for your lovable Bully, Whole Earth Farms Grain-Free Recipe Dry Dog Food is a great dry kibble option with no corn, wheat, or soy. Flavors include Turkey & Duck, Salmon & Whitefish, Pork, Beef & Lamb, and Chicken & Turkey. Each formula features high-quality protein as the first ingredient without using animal by-products. Whole Earth Farms offers a great value for all of this quality and is a good option for going grain-free on a budget. Fruits, vegetables, and vitamins and minerals are all mixed into this kibble to provide complete nutrition to your English bulldog. Rather than wheat or other grains, peas, potatoes, and sweet potatoes are used as a source of energy-providing complex carbohydrates that are easy to digest. Plus, there are no artificial colors, artificial preservatives, or ingredients from China. Going grain-free just became a less painful experience for your wallet!